Nolan Hunter is a proud Bardi man from the saltwater country on the Dampier Peninsula in the West Kimberley region. Leaving behind his role as CEO at the Kimberley Land Council (KLC), Nolan was one of three selected to participate in the Jawun Indigenous Corporate Leadership (ICL) program. In its second year in 2018, the ICL program or ‘reverse secondment’ places Indigenous leaders in long term placements with leading corporate companies. Nolan’s secondment was with Westpac Group where he joined two teams: the National Agribusiness team and the National Indigenous Business team. His objective was to better understand commercial business strategy, in order to benefit his community. In his role, Nolan gained a number of technical skills but the biggest learning for him came from the opportunity to understand the elements underpinning the success of the organisation. Nolan describes these as the culture of the organisation, the behaviours, the operating rhythm, and consistent internal messaging. Nolan’s experience with the National Agribusiness team also enabled him to identify the elements that could be used to address some of the challenges in his home organisation, KLC. Further, the experience helped inform his strategic focus and direction for the KLC and the wider West Kimberley region. This included thinking about economic and business development in a different manner, focusing on engaging more with industry, engaging with Westpac and his new networks, and ultimately creating strong partnerships. To further his development at Westpac, Nolan moved into the Indigenous Business team as Director of Relationships and worked closely with National Manager of Indigenous Business, Suzi Hullick. This sector aligned excellently with Nolan and his expertise. Nolan was given the opportunity to attend the 2018 Beef Australia conference, a program with Australian Rural Leadership Foundation, and Garma Festival with Westpac, which allowed him to build on his networks and connections. For example, as a result of the Beef Australia conference, Nolan connected with people in the animal genetics field and has since hosted them in the West Kimberley region to look at potential opportunities. From the secondment, Nolan felt he significantly increased his understanding of the corporate sector, and the structures and mechanisms that allow for the success of a large business. This opportunity allowed Nolan to explore higher strategies for economic development as well as build a network that he could benefit from back in his organisation and community in the West Kimberley. The secondment program also had a positive impact in terms of leadership development for the staff at Kimberley Land Council. While Nolan was away, a number of staff stepped up to fill senior roles. This was a great opportunity for Nolan to support and mentor his fellow workers and challenge them to take more of a leadership role within the organisation. This demonstrates an intended outcome of the ICL program; succession planning in home organisations and an investment in the next generation of leaders. 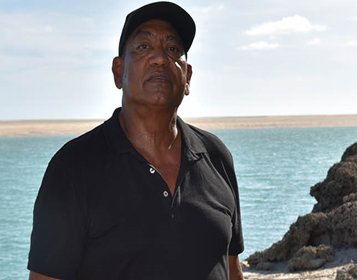 After completing his secondment in Sydney in December 2018, Nolan returned to his community in the West Kimberley. He has resumed his role as CEO of the Kimberley Land Council and brings back his new skills and networks to make a valuable contribution to the regional focus on Indigenous-led enterprise and economic development.